The DVD set below has not only all the Stooges shorts but also the two-reelers of Shemp Howard, Joe Besser and Joe DeRita! It's a fantastic set of Stooge material AND it's the first release of Columbia Pictures' non-Stooge shorts since, well, a very long time. 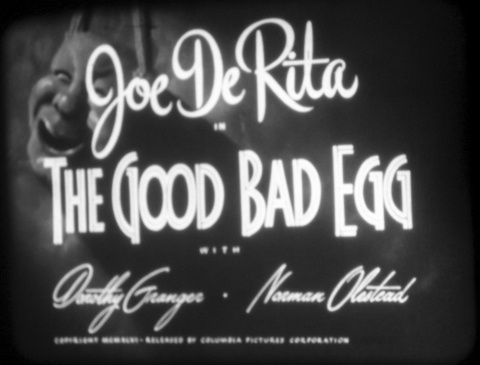 AND it include THE GOOD BAD EGG (1947)! 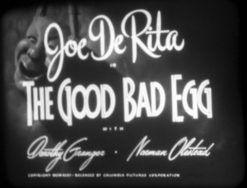 THE GOOD BAD EGG was Emil's second Columbia short starring Joe DeRita. 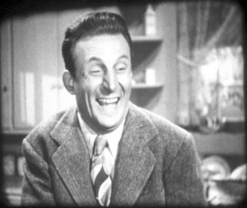 Although this role was a little bigger than his last two roles in RENO-VATED and MORON THAN OFF, no stills were taken. I feel like a Hollywood veteran actor now. My make-up I put on myself, dress, report on the set & patiently await the assistant director's call. 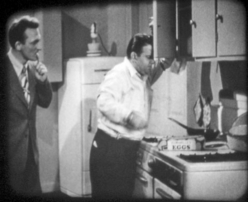 Joe DeRita is the star comic, and the scene where I, as his kibitzing friend, come to observe his new invention and peculiar situations wherein he burns his supper & fingers, tries to cook an egg - and finally kicks one right in my face. Kaplook, just like that. The entire working company, even from other sets, came en masse to watch me get the egg in my face. Emil's diary entry once again ends abruptly, as though he was distracted mid-sentence and didn't return to finish. With the suspense building, I really wonder what he was about to write. 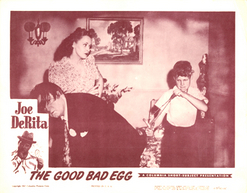 In any case, watching the film we do indeed see DeRita kick a gooey egg off his foot, and the next scene shows Emil receiving it smack in the middle of his kisser. His smile disappears and is replaced by a look of anger and repulsion. Fade to black, and that's the end of Emil's scene.